Appearance (0-20): The first thing that strikes me is the nice cedar packaging with the vintage stamp on it. It’s really very nice looking when combined with the green, red, and gold of the band. Upon unwrapping this from its cedar shell, I saw a very nice looking corojo wrapper. However, there was a bit of an issue that was immediately apparent – there were multiple large veins that dominated the outside with many other small veins throughout. 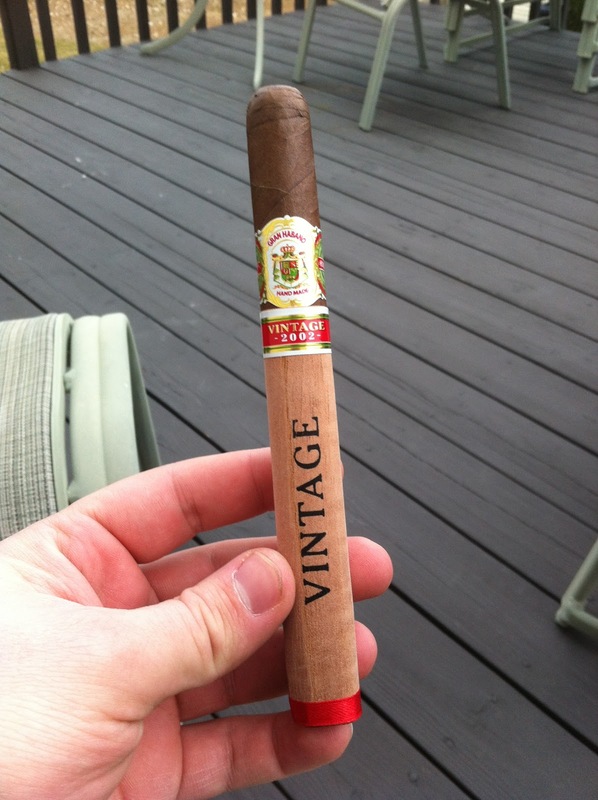 Construction (0-20): The Vintage 2002 seemed like it may have had some small gaps of tobacco. That would be nothing that I consider major, but it was enough to give me some pause with fear that the cigar might not burn quite right. My fears were put to rest though as in spite of the potential tobacco issues and veins, this burned only slightly askew. The draw was absolutely a positive, and the ash itself held for about an inch and a half at a time. 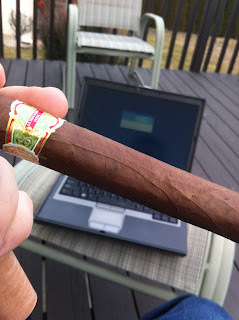 Strength (0-20): I really wasn’t sure what to expect with this one, as I haven’t had much experience with Gran Habanos. However based on it being a corojo I would have guessed about medium. Well, I was right. You can expect this cigar to sit almost right in the middle of the medium range. Flavor (0-20): There are two major flavors that take over in this and have a little tug of war – leather and roasted nuts. While the flavors seem to veer back and forth between then, other things pop up in much smaller quantities which include pepper, cedar, earthy flavors, and some other small spices. It’s extremely tasty with some small complexity. Value (0-20): There aren’t a ton of 7”x50 cigars out there that you can find for $2.50. There’s even less that you can consider to be a good cigar. This fits in those categories. Additional Notes: Paired with Turkey Hill Green Tea on my deck. Overall (0-100): There are some construction and appearance issues that I personally wasn’t a big fan of at all, but its really hard to beat this size of cigar, with the flavor it has, at the $2.50 price. Honestly speaking if you have the money to pick one of these up, and I surmise you can find that kind of cash under your couch cushions or in your car somewhere, do it. It’s worth a smoke. If you can’t stand spending the whopping $2.50, there’s a 5”x50 for $2.00. Being absolutely honest, this isn’t a top of the line cigar for me… but it’s a perfect second cigar or a perfect cigar for someone on a budget. The final third transitions to a leather taste with earthy hints on the exhale. Nice review! I just loved it.